So your pumpkin vine is glorious, large and healthy looking with deep green leaves and it’s even been flowering. There’s one problem. You see no sign of fruit. Do pumpkins self-pollinate? Or should you give the plant a hand and, if so, how to hand pollinate pumpkins? The following article contains information about the pollination of pumpkin plants and hand pollinating pumpkins. 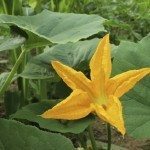 Before you panic about the lack of fruit, let’s talk pumpkin plant pollination. First off, pumpkins, like other cucurbits, have separate male and female flowers on the same plant. That means that it takes two to make fruit. Pollen must be moved from the male flower to the female. The first blooms to appear are male and they remain on the plant for a day and then fall off. Do NOT panic. Female flowers bloom within the week or so and males will continue to bloom as well. The simple answer is no. They need bees or, in some cases, you to pollinate. Male flowers produce nectar and pollen, and females have higher quantities of nectar but no pollen. Bees visit the male flowers where the large, sticky granules of pollen adhere to them. They then move on to the heavenly nectar produced by the females and, voila, the transfer is complete. The quality of the fruit is improved by increased pollinator activity. Now, for a number of reasons, despite the presence of both male and female flowers, the pollination of the pumpkin plants doesn’t seem to be happening. Perhaps, broad spectrum pesticides have been in use nearby or too much rain or heat is keeping the bees inside. Either way, hand pollinating pumpkins may be in your future. Before you can start hand pollinating the pumpkin plant, you need to identify the female and male blooms. On a female, look at where the stem meets the flower. You will see what looks like a small fruit. This is the ovary. Male flowers are shorter, lack immature fruit and usually bloom in clusters. There are two methods to hand pollinating, both simple. Using a small, delicate paint brush or a cotton swab, touch the anther in the center of the male flower. The swab or brush will pick up pollen. Then touch the swab or brush to the female flower’s stigma at the center of the bloom. You can also remove the male flower and shake it over the female to release the granules of pollen, or remove the male and all its petals to create a natural “brush” with the pollen laden anther. Then just touch the anther to the female flower’s stigma. That’s it! Once pollination has occurred, the ovary begins to swell as fruit develops. If fertilization did not occur, the ovary will wither away, but I have every confidence that you will be a successful hand pollinator.